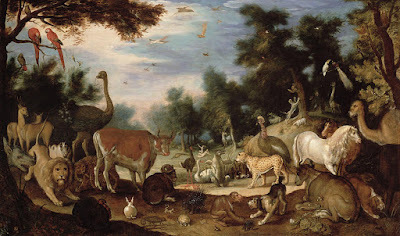 The theory of evolution, that all species including man arose gradually through a process of natural selection based on random mutation, has for many years been largely accepted by most Catholics. Along with that, the modern view that the earth is many billions of years old has also been accepted. Both of these obviously fly in the face of a literal interpretation of Genesis. But it has long been a claim of modern religious faith that they are perfectly consistent with a metaphorical or allegorical interpretation of Scripture. God may not have actually created the world in six twenty-four hour days, but the creation "myth" of Genesis is still true on a deeper theological level. While Genesis is obviously not a science textbook, it is still inerrant (as the Church teaches that it must be) if interpreted correctly on its own terms. Thus, we can have evolution, at least in some form - perhaps including a divine nudge or two here or there to make sure the "random" mutations go in the right direction or whatever - and a 4.5 billion year-old earth with ages upon ages of survival of the fittest - from unicellular organisms to trilobites to dinosaurs to rats to apes to humans - without giving up anything essential in Catholic theology or doctrine. It seems like almost a happy ending, doesn't it? We can have both our modern scientific cake and our Catholic cake and also eat them. The above is utter hogwash. If the theory of evolution is true and the earth really is billions of years old, then Genesis is not only literally false, it's false in virtually any other way that it could be true or false. Nor does it have any other meaning that is even remotely helpful. At best, it's a "myth" with no connection to anything. At worst, it's directly misleading - a lie. And thus the claim that the Bible is inerrant is a lie. And thus the Catholic faith is a lie. Of course, I'm a believing Catholic, so I don't think the faith is a lie. (Note the "if" three paragraphs up.) But in terms of the truth of the if/then statement, I'm with the atheist Richard Dawkins on this one. I'll be writing more about this topic in the coming weeks, including references to the Catholic Kolbe Center for the Study of Creation. And God said, “Behold, I have given you every plant yielding seed that is on the face of all the earth, and every tree with seed in its fruit. You shall have them for food. And to every beast of the earth and to every bird of the heavens and to everything that creeps on the earth, everything that has the breath of life, I have given every green plant for food.” And it was so. And God saw everything that he had made, and behold, it was very good. But I (God) am only going to provide a finite amount of food such that every beast of the earth will be locked in an unending struggle for survival that will result in the unnatural death by starvation or predation of the vast majority. Many creatures will eat each other, even though I earlier didn't tell you that. And you will eat some of them, though I didn't tell you that either. And once in a while you'll get eaten yourselves. Such a state of affairs will continue for billions of years punctuated by the occasional meteor that will periodically wipe out almost everything. Did I say before that it was very good? What I meant was, it might be very good for modern people to think about in armchairs, but for the trillions upon trillions of creatures, including some of your ape grandparents, who led brief lives of meaningless suffering, not so much. Intelligent atheists completely get the contradiction here. Modern faithful Christians don't want to get it, for obvious reasons. But I think most of them actually do get it, at least, subconsciously. Or if they don't get it, their kids will. I think this is is the primary reason for the decline of Western religious faith in the 20th century. I do believe that there are certain points that you do not know, haven't thought about, or just haven't properly considered. That’s perfectly possible. Do you have any particular ones in mind? What you claim to be a "little box" made by Protestant is the common teaching of the Saints and Doctors of the Catholic Church. Further, the idea that Adam spent aeons in the garden contradicts the teaching of Genesis that he died at the age of 930 years. And it is the common teaching that these years are also to be taken historically, and St. Augustine is particularly hard on those who wish to assign a symbolic meaning to them (which is ironic, seeing that Augustine is often falsely held up as if he were a pioneer of the modern reading of Genesis). +Oakes sorry! I wasn't notified that you had replied to me. There are several things, actually, too many to be discussed in a reply. However, the Hebrew word for day -- the language of the "Old Testament" -- does not specify "24 hours." So to say that God created the earth and all within it in a mere six 24 hour days is naive. The English word for day also does not spcify 24 hours. "Why, in Shakespeare's day . . ."
Really? Shakespeare lived for 52 years, so just which "day" are we discussing? See what I mean? In the beginning of Genesis God tells us that he STARTED something and FINISHED something and called that time period a "day." but the scriptures do not tell us just how long that time period actually was. Something you should consider is this: God NEVER called the seventh day "good." So, the seventh day HAS NOT ENDED . . . yet. From the creation of Adam, until now, is some 6,042 years . . . and counting. And the seventh day has not concluded . . . yet. "For a thousand years are in your eyes but as yesterday when it is past. And as A WATCH DURING THE NIGHT." A standard "watch" was three hours. so here, the Psalmist is telling us that to God, a thousand years is no longer than three hours. 21 hours shy of a 24 hour "day." But, as I said, it is too much to discuss in this format. I look forward to future installments. While I totally reject evolution theory, I haven't yet found a satisfactory explanation of geological strata and the fossil record. Much of Young Earth "science" also seems questionable to me, but I haven't done a ton of research into it. St. Augustine ridiculed those who would assign a literalist interpretation to the time of creation in Genesis. And if you really want to go down a rabbit hole I suggest you look at Eric Dubay's youtube videos on the rather recent postulation followed by discovery of 'dinosaurs'! Both evolution and the Bible are based on faith. But only the Bible has a reasonable causal explanation. It is not accurate to say “ridiculed,” though it’s true Augustine didn’t hold the view that the days of creation were 24-hour days. In fact, he held an opinion even more contrary to evolutionary belief (I say “belief” intentionally): that all 6 days actually happened in a single instant, and that the division of days was rather a description of the mode of Angelic knowledge of creation, that is, from the general distinction of the categories of things to the specific and particular. And when discussing Augustine’s views, it must be remembered that he too was a very hardline literalist. For example, he thought it arrogant and contray to the Faith to hold that man was older than the genealogies of the Scriptures report, or that the long years of the patriachs were symbolic rather than literal. It is also important to remember that it is the common opinion of all the Saints, Doctors, and the immemorial teaching of the Church that the creation account is a historical account. The only point where the Churc has allowed some difference of opinions, and largely only to accommodate the view of the holy Augustine, what exactly Moses meant by “day” in the first chapter. Pope Francis Tweets that Lent is about "Fasting from Sin"
"...and then in the Class of 1973 I caught this ridiculously awesome shot of my new favorite bishop." Born This Way? Scientist Claims to Have Discovered "Trad Gene"
Fantastic Interview! Bishop Thomas Daly, Cupich's Successor in Spokane, is the Anti-Cupich: "'Can't we all just get along?' No, we can't just get along." "I had a patient die during a transfer last night because our ambulance was stopped by protesters and had to drive an extra 45 minutes around the blocked roads...They can give their f**king safety pins to my patient’s fatherless 4 year old daughter." Jeepers, Creepers, Where'd You Get That Stang? Fr. Phillips Press Release: "The Review Board found me innocent of the accusations which I have vehemently denied." Cardinal Cupich Removes Pastor of St. John Cantius After Allegations of "Improper Conduct"
Was There a Biblical Flood? Was Adam an Ape Man? Fat Men in the Gym Pool: a Call for Modesty. Please. What to do with a heretical pope…Nothing? The Hirsch Files is Open for Christmas!